The following radio interview (audio only) was conducted recently with Hungarian Prime Minister Viktor Orbán. Hungary is one of the “Visegrad Four” (the others being Poland, Czechia, and Slovakia). These four countries are resolutely resisting the European Union’s push to distribute “refugees” among the member states through mandatory quotas. Mr. Orbán was the first leader to order the closing of borders and the construction of fences, while demanding that the Schengen rules be enforced as they were written. Notice the prime minister’s shrewd strategy for making certain that Hungary can build additional border fences when required: he arranged for the domestic production of fencing material in the country’s prison system, thereby avoiding any chokepoints that might suddenly emerge in international markets. The level of domestic production has allowed Hungary to export fencing to Slovenia, Macedonia and Bulgaria — prompting a German newspaper to refer to Mr. Orbán as “the patron saint of the Balkans”. 00:04 — this has triggered a domino effect in the countries along the way to Austria. 00:12 Are you prepared for it? What will it be like in 3-4 months time? 00:17 How will the member states in the Balkans cope with it? 00:20 ORBÁN: You have just cited the most important bit of news of recent months. 00:42 peoples deemed were necessary from the beginning. 00:51 foreign people without controls and checks. 00:57 and their solution was that they limited the number of people they will accept in a year. 01:18 beyond that, we have an immigration policy of not letting anyone in. 01:23 The Austrians have made a crucial step towards that end. REPORTER: Has common sense really prevailed in general? 01:29 Because what the Austrians said is just the first step. The most authoritative politician on this issue does not say it at all. 01:34 ORBÁN: Yes, but we should celebrate small successes, too. 01:38 Little steps count, too. REPORTER: Let’s look at the practical aspect of it. 01:49 If their answer is positive, they let them cross the border. But it seems to be rather uncontrolled. 01:56 but I do not think they are too important. 02:03 above which they will not receive those who arrive. 02:45 and from where they will be sent back sooner or later. 02:51 ”This number of people of you may come, and nobody else beyond that.” This is the core of it. 02:58 but what really matters is that they made that crucial step. 03:09 they will not cross Hungary, that is absolutely certain. 03:14 REPORTER: It means that you are ready to build the border fence in a short time there too? 03:39 to become independent from the market situation. 03:59 to Macedonia, Slovenia and Bulgaria. 04:12 that particular “common European solution” at long last. 04:16 And still many think it will be the migrant quota system. 04:30 is rather worrying, concerning the formation of a two-speed Europe. 04:46 the best response should be — it is immediately announced, that “a European solution is needed”. 05:12 to take over this task from the nation-states in short order. 05:28 ”common European solution”, and at the same time no effective steps are taken. 05:31 This is Brussels-ism: Brussels intending to take over more and more functions it cannot perform. 05:39 As a result it weakens the nation-states, thereby weakening the whole of Europe. 06:03 where it is the most lifelike and is in line with the natural order of life. 06:16 — and this is the biggest trouble in Europe today. 06:24 is actually to divert attention from what happened in Cologne and in general from the issue of migration? 06:34 just to divert attention from their own problems. 06:39 I do not presume things like that, about any European leader. 06:56 and draw up their opinions and declare that certain issues should not be solved in Brussels but in Warsaw or Budapest. 07:19 have not done anything that deserves criticism from Europe. 07:35 of the high-minded democracies which have existed for a longer time. 07:56 the Western part of the continent concerning the requirements of democracy. 08:00 On the contrary: there are phenomena in Europe that could not occur in Central Europe. 08:50 because our life, as far as democratic benchmarks are concerned, does not lag behind theirs. This entry was posted in Balkans, Counterjihad, Culture Wars, Domestic terrorism, Enrichment, Europe, Immigration, Media, News, PC/MC, Politics by Baron Bodissey. Bookmark the permalink. I know that many people think Viktor Orban is “over the top” somehow, but to me he is a true patriot who realizes that his duty is to protect and safeguard Hungary, which is his job. If he doesn’t play along with Brussels when he thinks it’s not good for Hungary, I would suggest the rest of the euro-pseudo-countries think again about what their duties are. It is not to protect Brussels, it is to protect their own countries. Historically, of course, Hungary has experienced Muslim invasions before so this is just sound common sense, which Madame Merkel seems to lack. Hungarian by descent, American by choice but I love both. I agree!! HUNGARIANS ROCK the EU to its core!!! He is sanity personified – plain common sense. I hope he sticks to his guns. The Poles are really abusing the Germans, saying that they well remember being under the German boot from World War 2! Maybe the western EU folks will finally wake up, crack down then deport all these invaders. I see it as a possibility, however it would cause civil unrest by the invaders as they feel threatened. Either way, bloodshed and mayhem will occur. The Poles are justified in not remembering the German occupation fondly, but they should be a little circumspect, as the occupation of Poland by Russia was not much better…and Poland may very well look to Russia for protection against the EU forces and even NATO. The EU has been quietly building up its own military capabilities…and of course, under the current Western leadership, it is always possible that NATO forces will be used in any “police” action to bring “rogue” states such as Hungary under the thumb of Brussels and the EU. I think if there is anything for which we should be grateful to Merkel for, it is that she, typically for fascist rulers, jumped the gun and mobilized the opposition to her policies before her enforcement apparatus was fully developed. In other words, the countries of Eastern Europe have been warned in no uncertain terms they will cease to exist unless they act independently…and they were actually warned while they still had time to act. These countries should never forget the intervention by NATO against the Serbs during the Bosnian or Kosovo wars, or the heavy US military commitment against secular governments in the Middle East. Christians versus Mohammedans — which side would you expect NATO to take? Each member country’s government is busy fighting Christians back at home too. Brilliant man! How I wish Europe had more leaders like this. Excellent translation, and an interview every European should listen to. 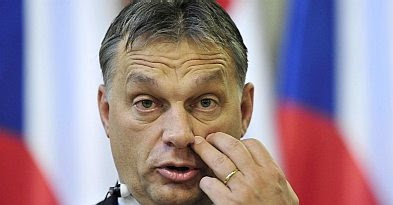 If anyone can save Europe from itself, it will be the articulate and outstanding Viktor Orban. I’m seriously thinking about getting out of this hell-hole, but where to go? I have considered Malta, but Hungary might be worth investigating. God bless you on your journey!! I wish for you the best. And I know just how you feel. Malta by the way is overflowing with islamics… sadly. My friend went on a cruise in the MED with her family and they stopped in Malta. SHOCKED her so bad that she went back aboard the ship with the other 2 ladies and 3 young’ uns and stayed there for the whole MALTA visit. The men in the party only did a one day tour and shopped . Then hey ALSO went back on board. My friend said NO WAY would she risk her kids getting hurt. That’s incredibly sad to hear. I have visited Malta, and I found it to be an incredible place. That was a few years ago, mind you. How sad to hear that the place where the Knights of St. John stopped a previous Islamic invasion in its tracks (in 1565) is now succumbing to the same self-destructive political disease that is killing the rest of Europe. Malta is an example of how ideas, not race, ruin a people. The Maltese are ethnically related to North Africans but have been Christian for hundreds of years. North Africa was, of course, once a civilised part of the Roman Empire (its ‘bread basket’) & was Christian before it was arabised & turned into a desert. Malta….isn’t Malta being submerged with “refugees” and African and muslim migrants?! After what happened to my Greek friends at Lebos last summer… stay outta there too. Are there any boltholes left in Europe? Mine used to be Switzerland but back in the 90s even, I was shocked by Lucerne. It only had a few middle eastern residents, but the city centre was no longer ‘swiss’ – overflowing rubbish bins & trash on the pavement. Every day I couldn’t wait to catch a train into the countryside. My excuse was the weather in Lucerne, but I now realise there was something more – I wanted to escape the ambiance, the feeling, of the place which, again, was something no longer Swiss. Why not try Hungary this summer. Lots to see and do. Place is a bit rough around the edges giving it an old world charm. Nice people and a lot safer than Greece or Malta. Found an old book with the prophesies of Nostradamus when I was rumbling around in the attic. Bought the book back in the eighties. Just for fun. I didn’t really believe in the predictions made in the book. Muslim invasion of Europe? Muslim headquarter in Cologne? Invasion and destruction of Rome? Give me a brake! That will never happen. Or so I thought. Now I’m almost chocked to read this again. Maybe good old Nostradamus really did have visions of the future? Cologne takes its name from the Roman Colonia, a good place for the new colonists to start to assert their authority. It’s also home to the Shrine of the Three Kings. The enemy has a superb grasp of numerology, so remember that number. The 7/7 London bombings were in 2005 (2+5=7). The 1/7 (8) raid on Charlie Hebdo was in 2015 (2+1+5=8). The 11/13 Paris attacks were 9/11 advanced by one pair. This year, the 333rd anniversary of the Siege of Vienna, is 2016 (2+1+6=9, or 3×3). It’s also the 15th anniversary of 9/11. So watch out for days with 1, 3 or 5: March 3rd, March 15th (Ides of), March 21st (the European Spring), May 1st (Mayday, like 911 a recognised distress call). Typo? Czechia? Czech Republic is the English version of Česká republika. “Czechia” is an accepted alternative name for the Czech Republic. Many Czechs use it themselves when writing in English. It’s quite correct; look it up. I have a question – what are the attitudes and actions of the other East European (former Warsaw Pact/former USSR) nations (Romania, Bulgaria, and the Baltics)? Are any of them taking in Muslim refugees? I would highly doubt it of course, but I am also wondering why they do not join the Visegrad group in that case as well. Adding those states would bring the Group to 9 nations, which I believe is a third of the EU. I also understand that Bulgaria might be a special case as it already has a large Muslim minority. Yes, Bulgaria is a special case. After being ruled by the Ottoman Empire for all those centuries, and gaining independence only recently, in historical terms, they have no fondness for Muslims or Islam. However, they do have a substantial Muslim minority to contend with, about 12%, maybe slightly less than France. During the migration crisis last year, Bulgaria was (as far as I know) the only EU country in which a migrant was actually shot and killed trying to force his way through the border fence. I’m told that Bulgaria makes sure that any illegal immigrants who do manage to cross the border are made to feel extremely unwelcome. The exact means by which the Bulgarians achieve this was not specified. Erdogan would have to pick that fight VERY carefully, because the Russians would stand behind their fellow Slavs. In a similar way the Russkis championed the Serbs against the Bosniaks and the Kosovars back in the ’90s. They couldn’t prevent the final outcome, because Ukraine and Hungary lay between them and the Serbs. They won’t have the same problem defending Bulgaria, because the Black Sea is a Russian lake. Such a battle is more evenly matched than one might think. a) Russia is 140 million people, Turkey is 100 million. However, Russia has had a low birth rate for a long time, so I venture that Turkey may even have as many or more men of fighting age. b) While Russia’s military is bigger, much of that is due to its very large Navy. In ground forces, the difference is not great. c) The Black sea may be a Russian lake, but even with Crimea, supplies would still have to somehow get through Ukraine to get there, at least until they build a bridge in eastern Crimea across the Kerch Strait. Those ships while on the Black Sea would be vulnerable to the Turkish Air Force. Turkish forces only have to cross two miles across the Bosporus. d) This is Turkey we are talking about, not the Arabs. This is the one Muslim country whose military is actually considered competent. e) Russia would be spreading herself thin, as she is already in Eastern Ukraine and Syria. What a refreshingly common sense man Mr Orban is. He has not been infected with the Euro homogenisation virus. He is saying what most ordinary people are thinking (even if they are frightened to say it for fear of being labelled an “Islamophobe”) – Hateful and inaccurate term. Unlike the majority of the leaders in the West, he seems to be putting his people’s welfare first! Unusual I know! I hope you’re not saying this to then support the Russia and Vladimir Putin. If it is to be patriotic, unless it is for real.